My collection in the beginning. continued to ad to the collection as I find other cream and green pieces. When we bought our retro farm house last March, I began buying a few vintage items here and there that appeal to me personally. I have an eclectic taste, but a consistent theme with the items I buy is that they are usually functional in some capacity. I love to find items that not only look nostalgic and fit in with my farmhouse theme, but that are also practical and usable. Enamelware kitchenware falls mostly into that category, although it is advised to be cautious about cooking with it. I personally fell in love with the cream and green enamelware which I found to be primary from Sweden and it is the only type of enamelware kitchenware that I collect. I only have a few pieces as I have found the color scheme to be more difficult to find and slightly more expensive than some of the other types. kitchens they have been in before mine. Enamelware was the craze of the 19th century and considered one of the first mass produced kitchen items as manufacturers found a way to coat steel and cast iron pots and pans with enamel, creating a product that was pleasing to the eye,, cheaper to produce, as well as easier to clean than what cooks had been using previously. Wikipedia defines enamel as being " a smooth, durable coating made of melted and fused glass powder". The range of items that fit into the category of kitchen enamelware is staggering and leaves a lot of possibilities for the collector who can often pick up pieces relatively inexpensively if one is patient and keeps their eyes open. In addition to kitchenware, enamel was used on a lot of other items as well including appliances, signs, sinks, and wash tubs to name a few. 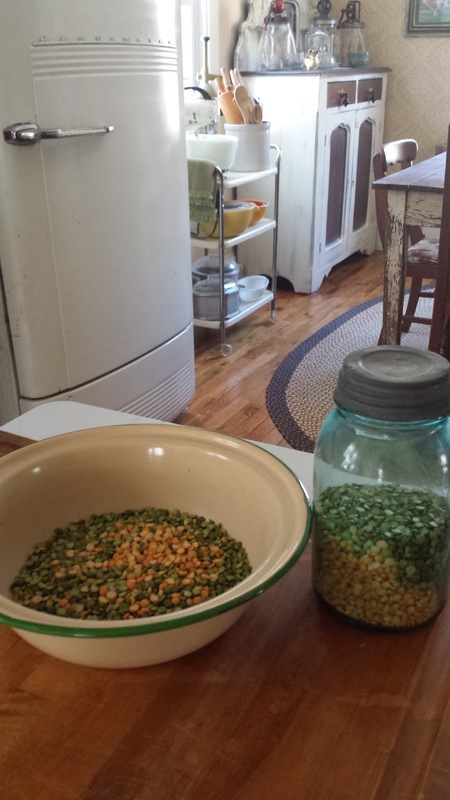 and pair perfectly with these yellow and green split peas. You may not want to actually cook with vintage enamelware. In the old days, few regulations prevented the uses of toxic materials. Despite manufacturers claims that enamelware was clean and sanitary, additives like lead and cadmium were often used in the production of bright colored frits. For instance, Le Creuset used cadmium in red and orange colored enameled iron cookware. The company still produces red and orange products but now complies with standards set by California regulations, some of the strictest guidelines in the world. While cadmium is still used, production methods prevent the toxin from being released during cooking. Also, the inner cooking surfaces are white. Years ago, a type of uranium used in the frit for brightly colored enamel was radioactive. US government regulations stopped the use of uranium based compounds used in the production of cookware in 1938. Today there is some concern that certain countries like China do not provide enough regulation to ensure safe cookware. Inexpensive lead tests are available on the internet and at many hardware stores. As I stated, I tend to buy items that are at least somewhat practical and functional, and while I don't use my enamel pots for cooking anymore, I do use them to collect kitchen scraps for the compost pile, to wash fruit or vegetables, to serve cold, food items or as a pretty, farmhouse "ice bucket" when we have company and are serving drinks. The Swedish green and cream is considered a safe, non toxic enamel. Ms. Monet's article also provides additional ways to show case those enamel pieces other than cooking with them as well as provides some practical ways to clean and keep enamelware in good condition. That information can be found towards the end of the article at the link provided above. Another excellent link with advice on cleaning these vintage pieces can be found at How to Clean Vintage Enamelware and Before and After: Cleaning Vintage Enamelware. 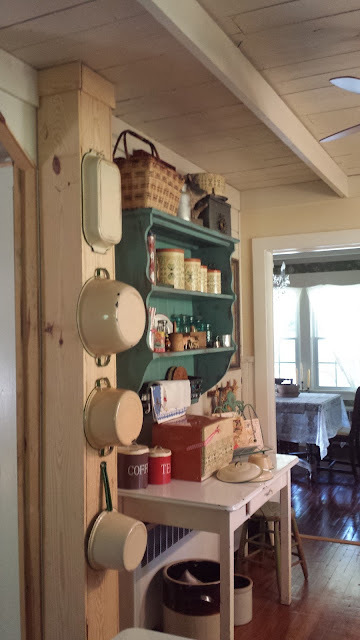 If you are interested in more detailed information on the history of enamelware, including a historical timeline that starts in 1761, visit the detailed article entitled History of Enamelware - Kitchen and Household. Mostly I collect enamelware because the simplicity and the colors make me happy and I am hoping a peak at my collection will inspire that same feeling in you. My pink wash tubs hang in the bathroom. The larger one was gifted to me by a friend and the smaller one I found for almost nothing at a sale.